Shrimp Ceviche - Home. Made. Interest. 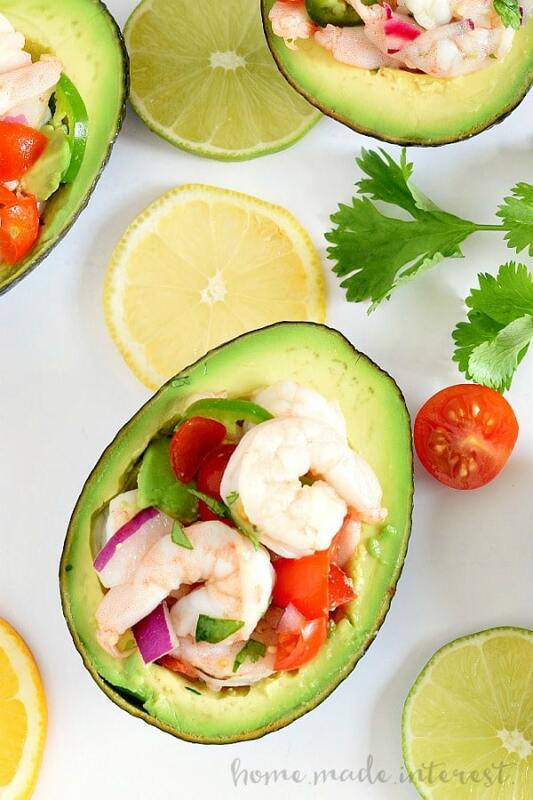 Bright, tangy citrus flavors, and the creamy goodness of avocados make this Shrimp Ceviche recipe a light appetizer recipe for the holidays, or a healthy, low carb, lunch or dinner idea. The holidays are upon us and you know what that means, from now until January it is all about food, food, and more food! Dinner parties, cookie exchanges, and home-baked gifts are part of the reason I love this time of year, I’ve never met a cookie I didn’t like ;), BUT as much as I love all of the holiday goodies sometimes it gets to be a little much and all I want is something less heavy (but still super yummy). 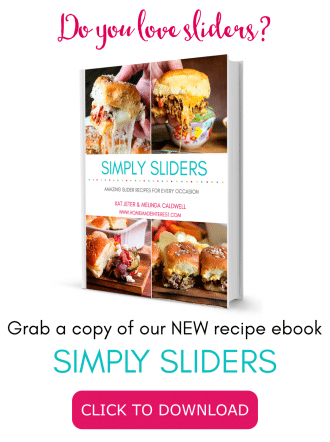 Since I host a lot of parties for friends and family I have a few light and fresh recipes in my arsenal to lightening things up. Don’t worry, there are still cookies for dessert! You guys have been with us long enough now to know I like recipes that are easy to make but look impressive. Hey, if I’m throwing a party I want people to “oooh and ahh”! This easy shrimp ceviche recipe is low carb, packed full of flavor, and it is beautiful with bright colors and fresh ingredients. 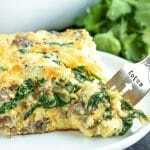 It’s also super easy to make and you can start it a day ahead of time. Score! 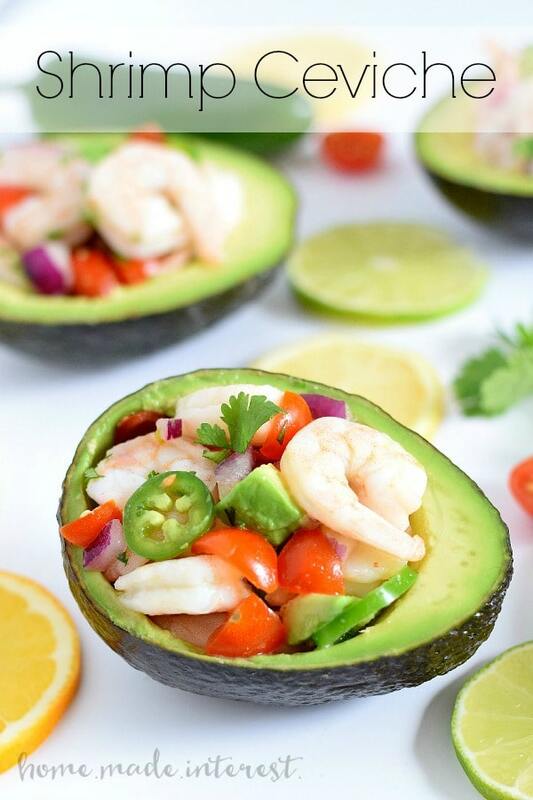 It’s a mix of shrimp, citrus juices, jalapenos, onions, tomatoes, and, my personal favorite, avocado. 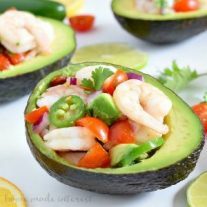 You can serve the ceviche in lots of different ways but the most impressive is serving it right in a fresh avocado. 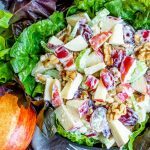 It is beautiful and delicious, and your guests are sure to be impressed. 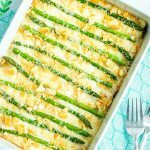 I serve it this way as an appetizer at smaller brunches or dinner parties, and I also make it this way for myself as a healthy lunch option when I’m on sugar overload after a marathon day of cookie baking. Shrimp ceviche is great for big parties too. 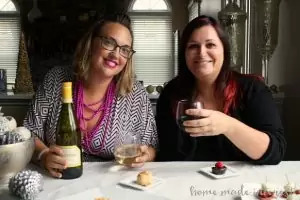 It is quick to make and it requires you to make it ahead of time so when the party is ready to start you just pull it out of the fridge and serve it up. If I’m making it for a really big group it doesn’t make a lot of sense to serve it in avocado halves so I just add a little extra cubed avocado to it, chop up the shrimp instead of leaving it whole, and serve it in a big bowl with tortilla chips. So much better than plain old salsa! Bring a large pot of water and salt to a boil. Add shrimp cooking for 1-2 minutes. Do not overcook! In a glass or ceramic container with a lid add shrimp and lemon, lime, and orange juice. Refrigerate for an hour letting the juices finish "cooking" the shrimp. 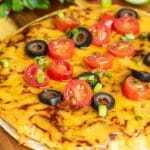 Add red onions, jalapenos, and tomatoes and put it back in the refrigerator for at least half an hour or until ready to serve. When ready to serve peel and dice one avocado and add avocado pieces, cilantro, and salt to taste to the ceviche. Slice the remaining avocados in half and remove the pit. Scoop out a little (not all!) of the inside of the avocado to make more room for the ceviche. Add a little salt to the inside of the avocado and then spoon in the ceviche to fill each avocado. 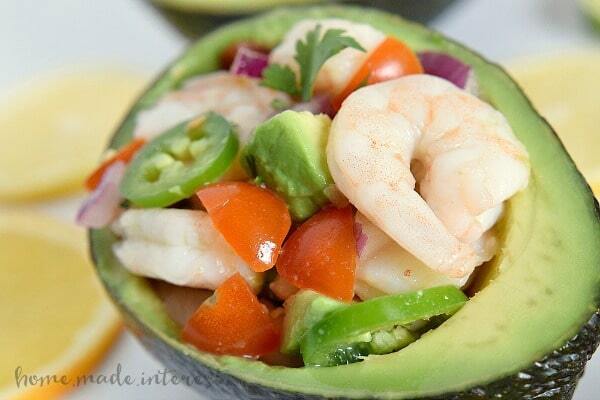 Note: If you are making this for a large group dice up the shrimp and dice up 3 avocados instead of one. Toss everything together and serve it in a large bowl with chips. This leaves you two avocados for lunch the next day! Alright, I’ve shared my secret weapon against holiday sweets overload. What light, fresh, recipes do you enjoy during the holidays? Avocado .. They were too ripe and hard to work with but still tasted awesome !!! This is a question. Do you know of anyone who has a recipe for “Crevette Ravigôte?” I don’t know if that is the way to spell that last word. I had it in New Orleans once when all the restaurants showed off their favorite dishes and you could buy tickets and taste however many you wanted to try. This particular recipe was then given to people who asked for it, and it was on a small piece of paper. It had caper sauce in it, and it was recommended that you use fresh-made mayonaise. I made it many times but the recipe is lost and I can’t remember exactly how it was put together and what the other ingredients were. But it was delicious!!! Paula, I do not but if I ever come across one, I will share it with you.